Payback in as low as 9 months! Depreciation is an added benefit. LES offers a simpler solution in conserving Energy on all types of lighting including, old fittings with copper chokes, new fittings with electronic chokes, tube-lights, CFLs, etc.The LES is a device that saves energy by maintaining the power delivered to the lighting loads at an optimum voltage, without visibly compromising on the quality of lighting (Lumen output) or comfort.All types of lamps (except incandescent bulbs) have a non-linear curve for power consumption and lumen delivered. Depending on the type of lamp, about 20% lower wattage results in 5 to 10% lumen drop, which is not easily perceived by the naked eye. Appropriate power supply to lighting loads also results in improved power factor and reduced harmonics. 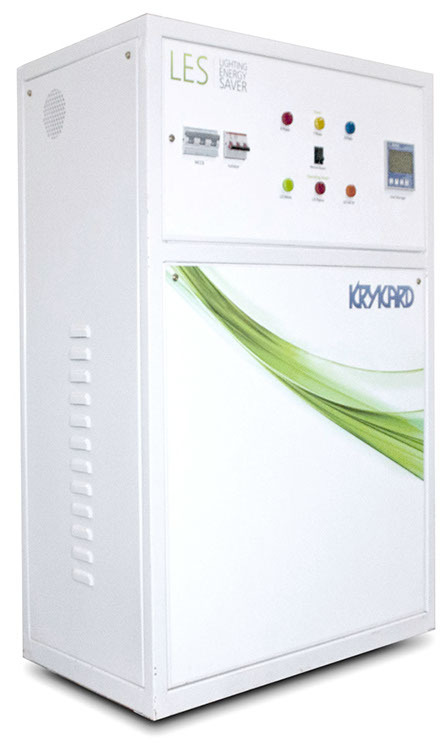 KRYKARD LES comes with a Load Manager to display kW & kWh among other electrical parameters, to know the energy consumption patterns with or without LES, thereby instantaneously quantifying savings in energy.